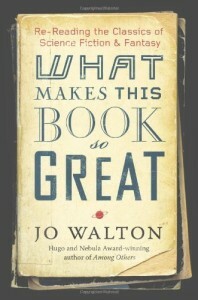 Back in 2002, Jo Walton won the Campbell Award for best new writer, and it’s as if she hit the ground running. There seems to be no stopping her — not that we’d want to. Since then she’s added the Mythopoeic Award (for Lifelode, a favorite of mine); the World Fantasy Award (for Tooth and Claw — another favorite); and both the Hugo and the Nebula (for Among Others, another fav — okay, this is getting silly). But (like Daryl Gregory) one of the remarkable things about her is her range. She seems able to do it all. And put her own twist on it, too. She’s written a novel of manners; but her novel of manners is a novel of manners in a society of dragons (Tooth and Claw). It sounds like it should be a joke –but damn if she doesn’t make it work, and work well. And the Small Change series (Farthing, Ha’penny, and Half a Crown), either puts a spin on the traditional “cozy” murder mystery by making it happen in an alternate universe, or puts a spin on the alternate universe story by making it a murder mystery. Her latest is My Real Children, which is as close as she’s gotten to mainstream fiction — and you know what? If you have someone on your holiday list who only reads mainstream, but who you want to seduce toward the SF/F side, My Real Children might be a nicely subversive move on your part. You should think about it. She’s got something perfect for every other person on your list too, actually. For the voracious readers, it’s Among Others; for those who like time-twisty tales, it’s Lifelode (alas, not available as an ebook, so order fast! ); if they love Jane Austen, it’s Tooth and Claw; and for the lovers of epic fantasy, there’s the Sulien series (The King’s Peace, The King’s Name, and The Prize in the Game). But for my personal recommendation this time around, I’m going into left field a bit and suggest What Makes this Book So Great. It’s a collection of short book reviews, and reading it is like having a fascinating conversation with a really intelligent person who knows a whole lot about the kind of books you love. She’ll give you some great insights on books that you’ve already read, while directing you toward lots of books that you might have missed when they first came out. She’s mostly talking about books she likes — so reading it is actually a very glad sort of experience. Enthusiasm and intelligence — all you need is a fireplace and a glass of wine, and it’s the perfect evening’s diversion.